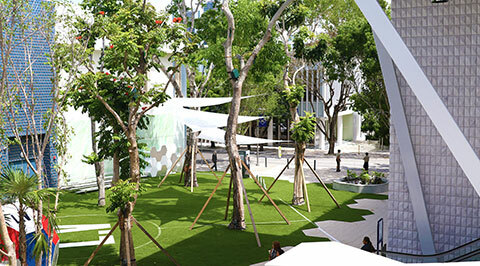 Paradise Plaza is the ideal location in the Miami Design District for open-air activations, film and photo shoots. Featuring Urs Fischer's "Bus Stop" and the work of famed artist Freeland Buck, Paradise Plaza opened in December 2017. The two-story retail center is at the north end of the Paseo Ponti walkway and offers access to a number of retail stores, restaurants, and public art. Paradise Plaza is home to flagship stores such as Gucci, Joseph and Rick Owens. It also boasts Spin's only retail location in the US, one of only three stores for high-end fragrance Creed, and will be home to Brad Kilgore's two upcoming restaurants, Ember and Kaido.